I put this look together for some weekend outfit inspiration. I know it's only Wednesday, but this way you have a few days to think about your weekend outfit and get really excited for any fun plans you might have! This is a look that I would wear out for dinner, drinks or dancing; I would wear it on a date or for a night out with the girls. The dress I have on is one of my absolute favorites, it is so versatile I can literally wear it anywhere and style it a million different ways. I picked it up at Nordstrom a few years back, and listed a few different dresses that have a similar look. I would definitely say that a simple little black dress like this is a staple for any wardrobe. The heels add a fun pop of color to an otherwise monochromatic look. 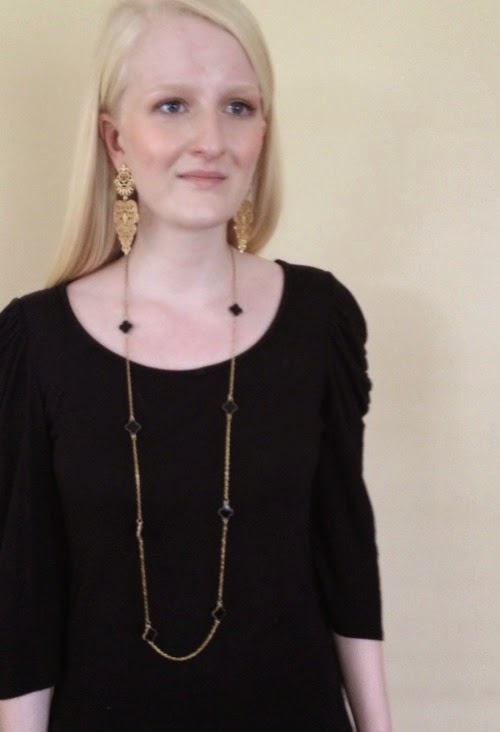 The gorgeous earrings and necklace that I am wearing were sent to me by Born Pretty. Born Pretty is a website specializing in the latest fashion and accessories. Their prices are great, which will help you to keep up with all the trends. I'm really happy with the quality of the jewelry as well, and look forward to pairing these pieces with many different looks. There are so many fun things in the Born Pretty store and I highly recommend checking them out. The people at Born Pretty were so kind and sent me a 10% off code to share with all of you! Head over to www.bornprettystore.com and type in the code 'KTT10' at checkout for your 10% off. Have fun shopping! So pretty! I love a classic LBD and love the pop of color in the shoes! Plus, that necklace is amazing!